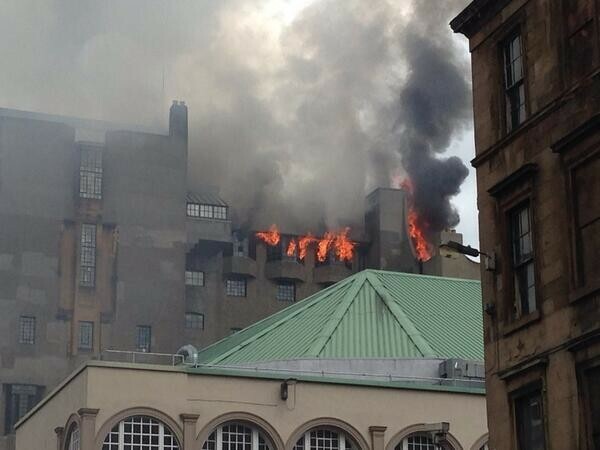 Firefighters are battling to rescue Glasgow School of Art from a blaze that has engulfed its iconic Charles Rennie Mackintosh-designed building. The fire service was called in at 12.30pm, but flames and smoke can still be seen billowing off the roof. The art school said on Twitter that everyone had been safely evacuated from the building, and have since issued an email stating that the fire was contained in the west wing, the area that contained a library full of priceless books. Unconfirmed reports say that the building's interior, from the library to the degree show space to the interior tiling, has been "gutted". The fire is thought to have started in the basement of the school, before spreading up five floors and setting the roof on fire. Witnesses say the blaze started when a projector exploded in the basement and ignited expanding foam that was being used for a student art installation. Some students were stood outside the evacuated building in tears. Today was deadline day for many students, who had installed work all over campus in preparation for their degree shows and end-of-year assessments. Now years of students' work may been destroyed. "All that effort is gone, everyone's work on that side of the building is ruined. Even if it didn't catch fire it will be damaged extensively," Hugh Thornhill, a second-year student, told Heart. "The degree show next month is pretty much a bust now, it's sad." Hugh Pearman, editor of RIBA Journal, the house publication of the Royal Institute of British Architects, is not optimistic about the chances of survival for the historic and much-loved building. "I think we've lost it," he told Dezeen. "Fires can look worse than they are but the spread of flames right across the top does not augur well at all." "I've seen a lot of buildings burn in the time I have lived in Glasgow, some iconic, many not, but I've never shed a tear over any of them until today. The Mackintosh building at Glasgow School of Art is universally loved in this city and beyond. I pass it almost every day, and yet still always pause to look at it. It's the first place I take visitors to the city. But, apart from being a breathtakingly beautiful building, both inside and out, and an iconic Glasgow landmark, it is a living, breathing, working building that is the heart, soul and centre of Glasgow's creative community. "It's too early to know if it can be salvaged or restored, but it really feels as if Glasgow has lost an important part of itself today. A friend who works in the building posted this just now: 'All those years of creativity, the feet on the steps, the hands polishing the walls of the stairwells, the blood, sweat and tears, the fabric of the building has absorbed so much more... And now it's gone.' This building truly did absorb so much and then radiated it out to the rest of this great city, and the sense of sadness radiating back from all around the city is palpable. Devastating."